Trustan Times gamely held off Holywell by two and three quarter lengths to win the £80,000 Betfair. Don't Settle For Less "Fixed Brush" Handicap Hurdle over three miles. The top-weight carried 11st 12lb and trainer Tim Easterby said about the 10/1 winner: "Trustan Times is a very decent horse. I thought the handicapper had overdone him at Wetherby but I was wrong. The handicapper is usually right, isn't he? "When I saw the 14/1 about him this morning, I thought well maybe the handicapper has done him today. "Peter (his father) bought him out of a point-to-point in Ireland and he was a very decent horse when he came to us. "He has just taken a bit of time. He is only six now and won over fences last season. We gave him a bit of a rest and he could be a top chaser but we will stick with hurdles for now. "We saw this race and said that looks all right. That was the plan. I don't know where we will go now. We could take the big boy on (Big Bucks) - we might finish second." Winning rider Dougie Costello said: "He was always a nice horse. We were saying that it took him a while last season to learn how to race - he was always keen and then he would flatten out in the middle part of the race before plugging on again. "He has learnt how to race this year and you can ride him a little bit closer. He is a horse with bags of ability - he has pulled up in front with nearly 12st on his back on this ground. He is a really exiting horse and I am sure that he will be winning one or two more big races before the season is out. 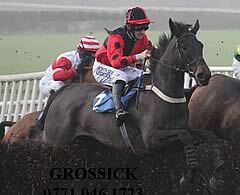 "He finished his race at Wetherby very well and come here in peak form. He has won like a nice horse with that weight on bottomless ground. He will win good prizes this season over hurdles - it has taken a year to find himself and I would like to keep him hurdling this year." Jennie Candlish, trainer of fourth-placed Barafundle, said: "We're delighted with him - it's just a massive relief to get him back on a racecourse. He had a niggling ligament problem which has kept him off the track for the best part of two years and I just wanted to get it right before he came back into training. "He'd have preferred better ground but to finish fourth after all the problems he's had is fantastic. He'll now go chasing sooner rather than later - we hope he'll be as good at that game as his brother Flemenstar (who won the Grade 2 Fortria Chase at Navan on November 11)." Tom George, trainer of third-placed Sivola de Sivola, said: "He's run a solid race. The ground was fine for him and, although a slightly stronger pace would have helped, we've got no excuses."